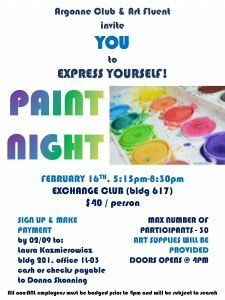 Join other artists at the Exchange Club (Bldg. 617/Lower Level) and create you next masterpiece! Plan to attend Paint Night on Thursday, February 16th. Painting begins at 5:15PM. Posted in Announcement	| Comments Off on Think Spring! Paint Night!